I have been trying to draw more regularly. I am not a great person for Lent, the time of year before Easter, as I find the liturgical year somewhat confusing, but these past years I have been taking the opportunity to add something into my life in these weeks that I feel needs to be added. This year it has been an effort to do art each day. It gives me joy, and is definitely something I feel called to do, and yet never seems to have a deadline, so often slips off the plate. 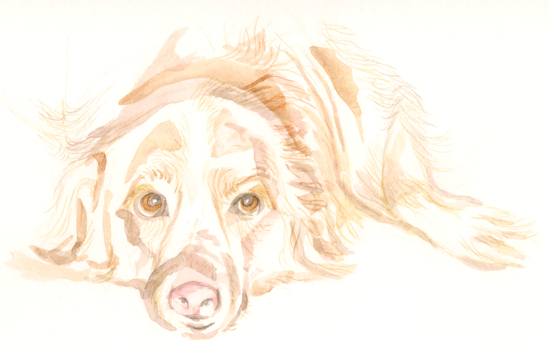 This drawing is of my daughter’s rescue dog, Professor Pudding, who is a blessing to be around. This was written by lynn. Posted on Friday, March 18, 2016, at 9:31 am. Filed under the arts. Bookmark the permalink. Follow comments here with the RSS feed. Both comments and trackbacks are currently closed.